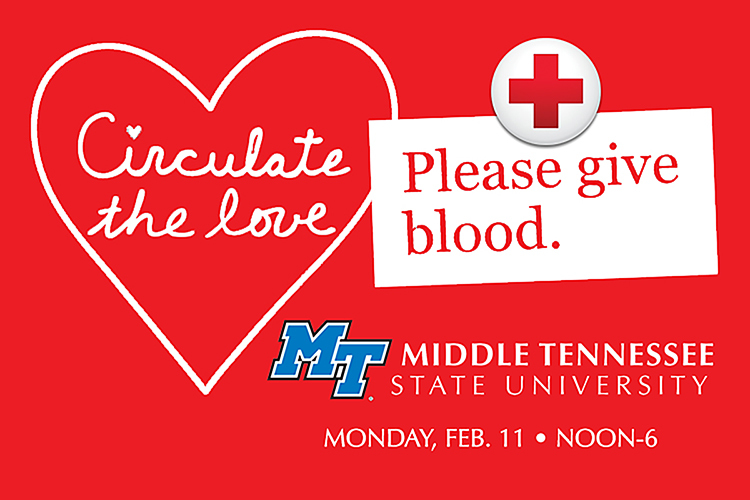 MTSU sets $300K goal for ‘True..
Festival of Chinese Arts retur..
There’s still time to squeeze into one of a few remaining appointments this Monday, Feb. 11, and “circulate the love” among Middle Tennessee neighbors by donating lifesaving support at MTSU’s valentine blood drive. The event is set from noon to 6 p.m. Feb. 11 in Room 322 inside the Keathley University Center, located at 1524 Military Memorial Drive in the center of campus. A campus map is available at http://tinyurl.com/MTParkingMap. Off-campus donors can obtain a special one-day permit at www.mtsu.edu/parking/visit.php. This blood drive is open to MTSU students, faculty, staff, alumni, friends and neighbors across Middle Tennessee. Each donor will receive a T-shirt as thanks for their lifesaving help. Donors can make an appointment for Feb. 11 here, use the new “American Red Cross Blood” app, or text “BLOODAPP” to 90999. Walk-in donors also are welcome. 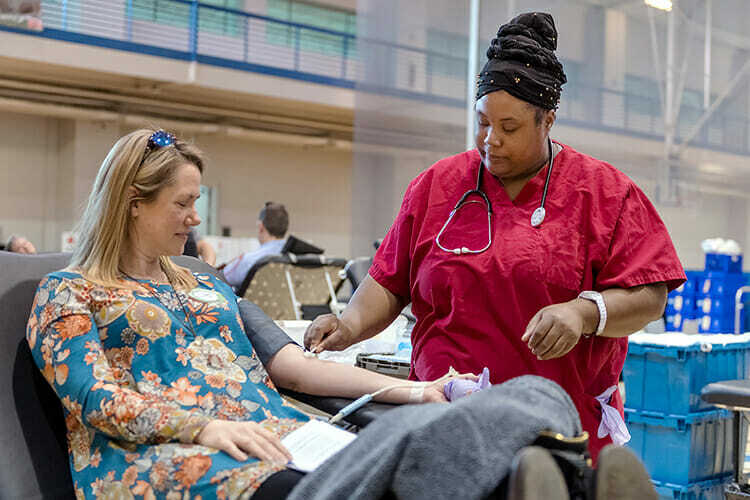 The Heart of Tennessee chapter of the American Red Cross has said that local — and national — blood supplies are so low that they’re making emergency appeals for eligible donors of all types. Platelet donors are urgently needed, and people with type O blood — the “universal donor” — are especially asked to take an hour to donate. Blood donated at MTSU can help neighbors in all 17 counties the Heart of Tennessee chapter serves: Rutherford, Bedford, Cannon, Clay, Coffee, DeKalb, Franklin, Jackson, Lincoln, Overton, Marshall, Moore, Pickett, Putnam, VanBuren, Warren and White counties. Blood products also can be shared with the rest of Tennessee’s 95 counties, folks in Arkansas and Mississippi, and nationwide if necessary. The American Red Cross must collect more than 13,000 blood donations each day nationwide to help accident victims, surgery patients, organ transplant patients and those being treated for leukemia, cancer or sickle cell disease. The Tennessee Valley region must collect 500 blood donations every day to meet the needs of regional hospitals. For more information about donating blood for the American Red Cross, visit http://redcrossblood.org anytime.